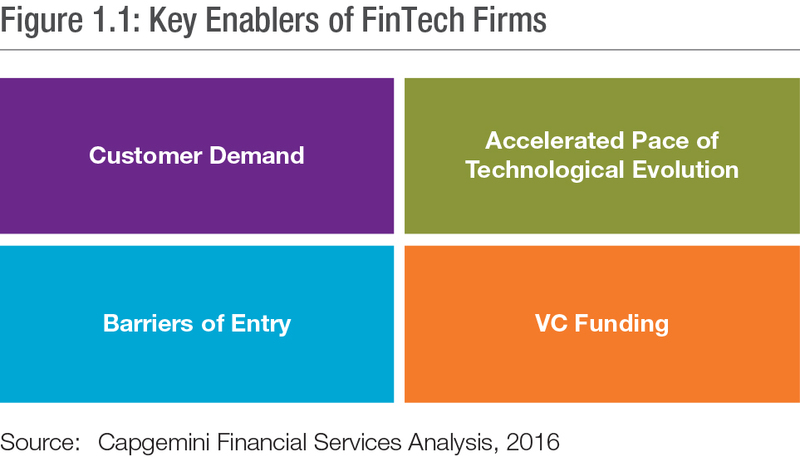 Non-traditional or FinTech firms are fast catching up with traditional firms in financial services. This rise of FinTech players has been caused by multiple factors of increasing customer expectations, expanding VC funding, reduced barriers to entry, and increased pace of technological evolution coming together to form a perfect storm. Traditional firms have been slower to respond to rising customer expectations and as a result FinTech providers have exploited the gap as more than half of them use at least one FinTech provider across domains. Customers are embracing new FinTech providers, with compelling offerings, taking advantage of the latest in technology to deliver better value propositions. As Hardeep Walia, Founder and CEO of Motif Investing (a FinTech firm) noted during his agents of change discussion, “Everyone should focus on what they do best and for us it really is core innovation”. To learn more about the key moments of truth, including the areas where traditional and non-traditional firms outshine each other, and the key customer segments and touchpoints which the firms need to address, please download the report. Most executives understand and acknowledge the FinTech revolution and agree on the high impact that FinTechs have on the FS industry (close to two-thirds of executives say FinTechs are setting the bar higher for the entire industry). As a result, traditional firms are pursuing a wide range of strategies in response to FinTechs and are also taking approaches to implement these strategies. Many firms, including DBS Bank, are looking to work with FinTechs in order to implement innovation. “FinTechs (and start-ups) are great resources to partner with and in the last 12 months we have partnered with, acquired, or licensed over 10 FinTech companies”, said Neal Cross, Chief Innovation Officer during the AoC interview. However, the actions of traditional firms to foster innovation have not translated in the proportional effort and even less so on the results. Only a small fraction say they have achieved the ideal of embedding innovation into their cultures. The greatest percentage say they have only “moderately structured” initiatives in place. What are the key approaches and strategies being taken by traditional firms? Why are firms not able to achieve effective results on applying innovation? What are some of the best practices firms are following to apply innovation? To find answers to these questions and more, please download the report. To achieve effective results while applying innovation firms will have to develop a culture of innovation backed with a long-term vision of applying innovation. Specifically, adopting a step-wise approach for applying innovation – Discover, Devise, Deploy and Sustain – will help the firms spread innovation throughout the organization. In addition, securing senior leadership commitment, having a clear vision, and adopting a more innovative culture will be important for addressing disruption. “You have to be willing to go outside the norm and to be willing to redefine your product completely and start from scratch. We don’t redefine but start from what the customers need. The second piece is you have to be able to invest in the talent and the culture”, said Yolande Piazza, MD, Strategy and Planning at Citi while talking about applying innovation at their firm during the AoC video discussion. To read more about how some of the firms are applying innovation and what disruptive forces the firms and FS industry is expected to face in future please download the report.